Each day is a gift - use it to the fullest and with gratitude, for you can never reclaim it. 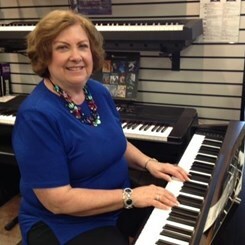 Piano and Voice Instructor at Severna Park Music & Arts. Teaches all age levels: Kindergarten - Adult; custom designed lessons to suit each student's level of interest and ability. Works with students on all skill levels. Education: B.S. in Music Education from Susquehanna University Conservatory of Music, Majors in Piano and Voice; M.S., C.A.S. from Loyola College of Maryland; Theological Studies from Board of Higher Education and Minsitry, Nashville, Tenn. Ordained Deacon, United Methodist Church and licensed clinical psychotherapist, in private practice. Teaching experience: Public and private school music - grades K-12, plus studio student lessons; directs musicals within church settings; life-long church musician, directing children's and adult singing choirs, children and adult handbell choirs, pianist for worship and special services; serves as Minister of Education, Evangelism, and Music at Nichols-Bethel United Methodist Church, Odenton, MD; 40 years total teaching experience. Performance experience: Featured soloist in oratorios, opera and musicals, including: Elijah (Mendelssohn), Messiah (G. F. Handel), Christmas Oratorio (Saint-Saens), Requiem (Faure'), Amahl and the Night Visitors (Gian-Carlo Menotti), The Magic Flute (Mozart), Sunday Excursion (Wilder), Brigadoon (Lerner & Loewe), Damn Yankees (Adler & Ross), Sound of Music (Rogers & Hammerstein), church soloist. Linda is a mother and grandmother of 4 children and 1 grandchild. She is an avid reader, and enjoys walking, gardening, and loves to cook.